Recombinant fragment within Human MMP2 aa 444-575. The exact sequence is proprietary. 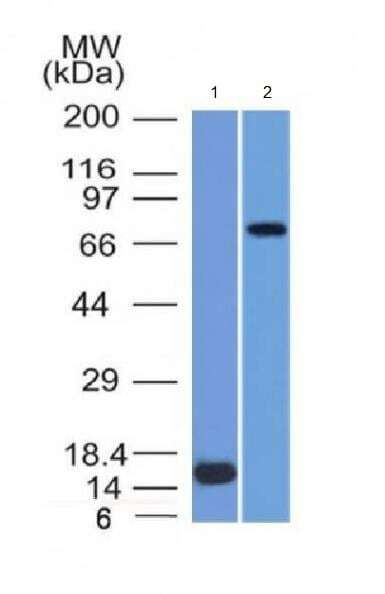 WB: Recombinant MMP2 protein and U87 cell lysate. Our Abpromise guarantee covers the use of ab218462 in the following tested applications. Protein Array Use at an assay dependent concentration. WB Use a concentration of 0.5 - 1 µg/ml. Predicted molecular weight: 74 kDa. ab218462 was tested in protein array against over 19000 different full-length human proteins. Z- and S- Score: The Z-score represents the strength of a signal that a monoclonal antibody (MAb) (in combination with a fluorescently-tagged anti-IgG secondary antibody) produces when binding to a particular protein on the HuProtTM array. Z-scores are described in units of standard deviations (SD's) above the mean value of all signals generated on that array. If targets on HuProtTM are arranged in descending order of the Z-score, the S-score is the difference (also in units of SD's) between the Z-score. S-score therefore represents the relative target specificity of a MAb to its intended target. A MAb is specific to its intended target if the MAb has an S-score of at least 2.5. For example, if a MAb binds to protein X with a Z-score of 43 and to protein Y with a Z-score of 14, then the S-score for the binding of that MAb to protein X is equal to 29.
ab218462 has not yet been referenced specifically in any publications. Publishing research using ab218462? Please let us know so that we can cite the reference in this datasheet. There are currently no Customer reviews or Questions for ab218462.